New gen Audi A6 will be launched in India next year. Hat tip to automotive enthusiast Hemant Somnathe for sharing this exclusive spy video. Audi had introduced the new gen A6 at the 2018 Geneva Motor Show. Recently, the luxury sedan was spotted doing testing on Pune’s roads. While on test, the car didn’t sport any camouflage and looked launch-ready. Talking about the new A6, the luxury sedan has grown in dimensions compared to its predecessor. It is 2mm taller, 12mm wider and 7mm longer than the outgoing model. Audi has increased the wheelbase too which now stands at 2,924mm; 12mm longer than its earlier counterpart. It is expected that Audi will launch 2 drivetrain options with the A6. The 3-litre turbocharged V6 petrol motor will churn out 335hp and 500Nm of torque while it will be paired with a 7-speed S-Tronic automatic transmission. The 3 litre TDI diesel unit will be mated to an 8-speed Tiptronic auto box while it will produce 282hp and 620Nm of torque. ‘Audi’ translates into ‘listen’ in Latin and this time the German automaker is offering Bang & Olufsen sound system on the top of the line trims. The 1,820-watt 19 speakers setup uses 19 separate channels and delivers 3D sound at the rear. There is no noticeable visual difference between the test mule and the car which was revealed for the international markets. One interesting point is that the Audi A6 comes with fake dual exhaust ducts. The actual exhaust emits the waste gases directly towards the ground however to make the car look sportier and more aggressive, Audi has added 2 fake exhaust ducts in the rear panel. Once launched, the new Audi A6 will compete against the likes of BMW 5-series, Jaguar XF and Mercedes-Benz E Class. 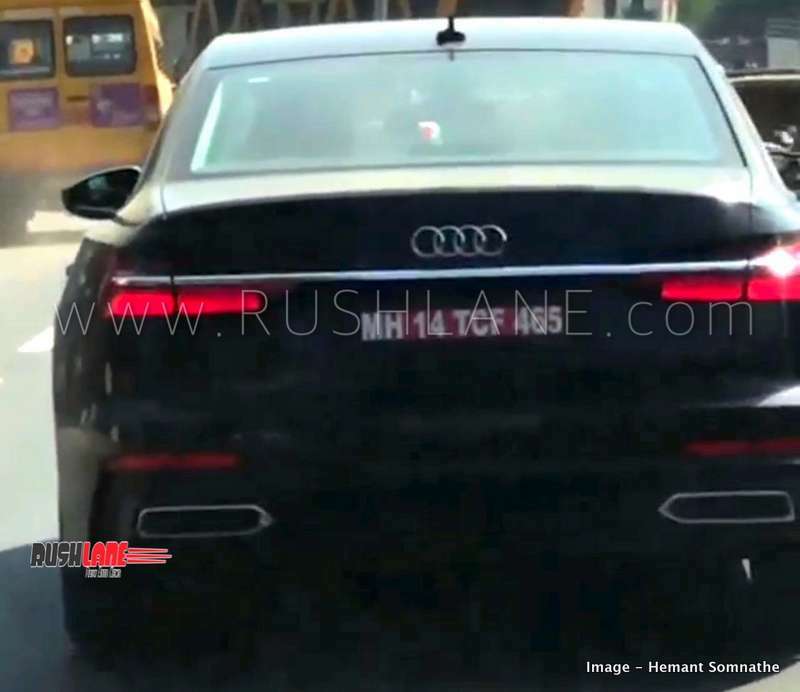 The current generation A6 starts to retail at approximately INR 55 lakhs and the upcoming version is expected to carry a price tag of around INR 55-63 lakhs.